There’s nothing as fickle as a market I guess. Products that go from boom to bust in a few short years, or less today when we think of technology. In the past Waterford, along with many other ports traded in a commodity that was considered an essential for the food industry, Ice. It was a market that reigned for less that sixty years but there are echoes of it in the harbour still. My interest in Ice stemmed from finding the Faithlegg Ice House as a child. This old structure was probably built at the same time as Faithlegg House, 1783, and used by the Boltons for impressing party guests during the summer with cooled drinks, sorbets and ices at a time when it was impossible for most people except in winter. It could also store meat, poultry and fish. Such Ice House designs dated from the 16th C at least and were based on the reality that Ice, once gathered into a cool, dry spot, compacted together and allowing for the run off to drain away below, would keep for months or even years. 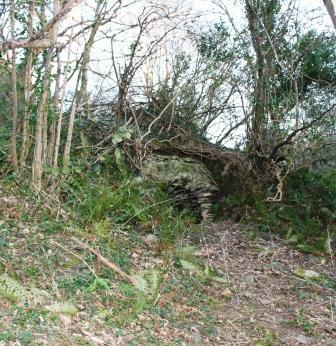 The other Ice House in the area, was about a mile away, via an old roadway that ran through Faithlegg to Ballycanvan. You crossed the now removed bridge at Faithlegg Pill into Ballycanvan and down to Jack Meades via the woodlands road. 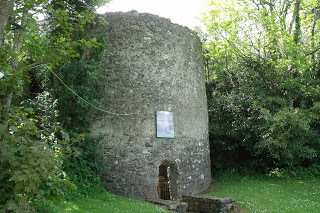 This is a commercially sized Ice House and even today is an impressive structure. No one seems to know the date it was built. I find it interesting that when travel writer and social commentator Arthur Young visited in 1796 and again in 1798 that he failed to mention it, suggesting it is a later build. Its location is to protect it from the sun, and it has a double wall to the south west which would have further insulated it, The original entry point was nearer the roof, the current access point is a more modern feature, Some have suggested it served a similar function to its smaller neighbour, providing for the several big houses in the locality such as Ballycanvan, Mount Druid, Brook Lodge, Blenheim etc. A third example is an “Ice Box” which Pat Murphy from Cheekpoint helped me locate recently. 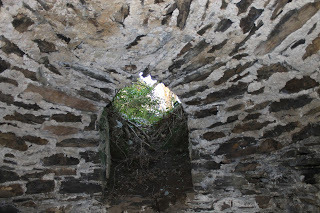 The box is a stone and mortar circular structure about 15ft diameter. Access was via the roof and it is built into the western bank of the river Barrow on the Wexford side, above Great Island. Pat could remember the name clearly and also stories of the paddle steamer stopping in the river below it, and boxes of iced salmon being removed to the ship for transport to New Ross and, he presumed, export. 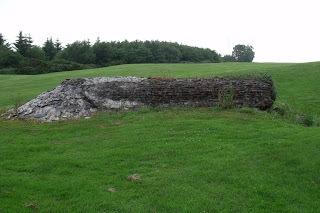 The Ice used in such structures was originally gathered from frozen streams, but at the time that Faithlegg was built a new technique had emerged. Due to the enormous resources, particularly man power, such houses had, it was a practice to flood a flat area of land close to a stream during a cold snap. I’ve found what I imagine to be the Faithlegg ice field below the current Park Rangers ground only recently. Unfortunately none of the older residents can confirm the theory however. Such streams and flat fields are features of the other sites too. In America a new business emerged in the early 1800’s which became known as the Ice trade and the commodity had extended to Norway by the 1850’s. American Ice had made its way to Britain but was not considered commercially viable, the merchants preferring the locally sourced material, despite its poorer quality. However a rise in temperatures seems to have impacted the home grown trade, and initially speculator merchants travelled northwards to source ice, but it really picked up once the Norwegians saw the potential. Ice was cut into blocks in Norway and transported to Ireland and throughout Europe. The blocks were put aboard ships, insulated with saw dust, to prevent fusing together, and then transported to ports. Merchants tended to store the ice in purpose built buildings or basements and then disperse it as required. Subsequently I have discovered that newspapers of the time are full of ads and other coverage of the trade by merchants and fish mongers in cities such as Dublin, Belfast and Cork. Their businesses were forced to close at the start of WWI when the sea trade was curtailed. After the war the new technology of refrigeration was the issue and soon the trade would be consigned to history. Only echos now remain in the harbour, but the echoes are significant, especially to the curious. Postscript: The Barony Echo, newsletter of the Barony of Gaultier Historical Society carries a brief mention of ships arriving to Passage East from Nova Scotia carrying Ice for the cellars of Waterford in their most recent edition. Thanks to Pat Murphy and Liam Hartley for their help with this piece. Also Tommy Deegan on the Waterford History Group. Ref: Buxham. T. Icehouses. 2008. Shire Publications. Buckinghamshire. Whatever happened the SS Honved? 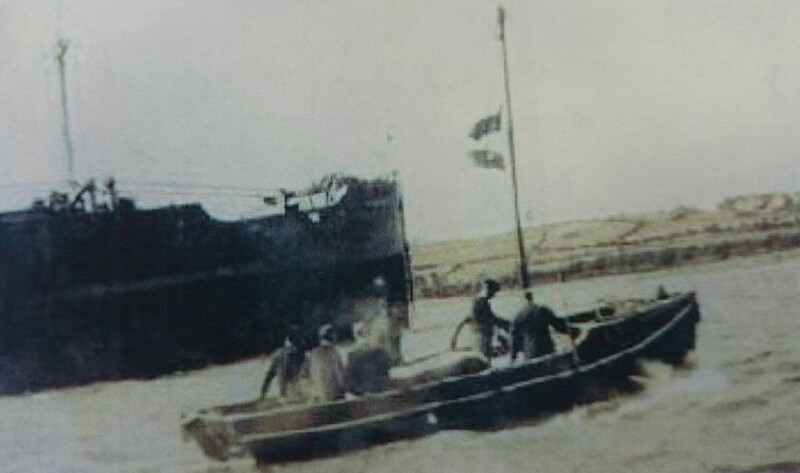 The SS Honved was a Hungarian registered ship when she called to Waterford in 1932 with a cargo of Maize for Halls in the city. She dropped down to Cheekpoint to await an outgoing cargo, and whilst there, her Captain died. Rudolp Udvardy was subsequently removed to Faithlegg Church for his funeral mass and burial. I’ve blogged before about the night of the removal in a story called the night the devil came for the Captains corpse. 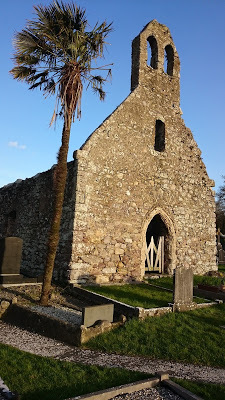 And the story of his grave is recorded in the account of Why there is a palm tree in Faithlegg graveyard. As a child I had a fascination with the story. This was probably because my Grandmother was so involved, but in seafaring villages such ships, seamen and events were told and retold regularly and always fired my imagination. However one question that I had, it seemed no one could answer. And that’s the question I want to answer in this post. Whatever happened to the SS Honved? The Honved was built in 1928 by the Swan and Hunter Shipyard in Sunderland. One of the most famous ships to be built there was the SS Carpathia which was the first vessel to arrive after the sinking of the Titanic. 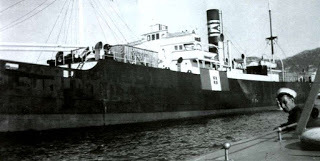 She was ordered for the Levant Steamship Company which operated from Budapest, Hungary, but the ship itself was registered at the Italian port city of Fuime. 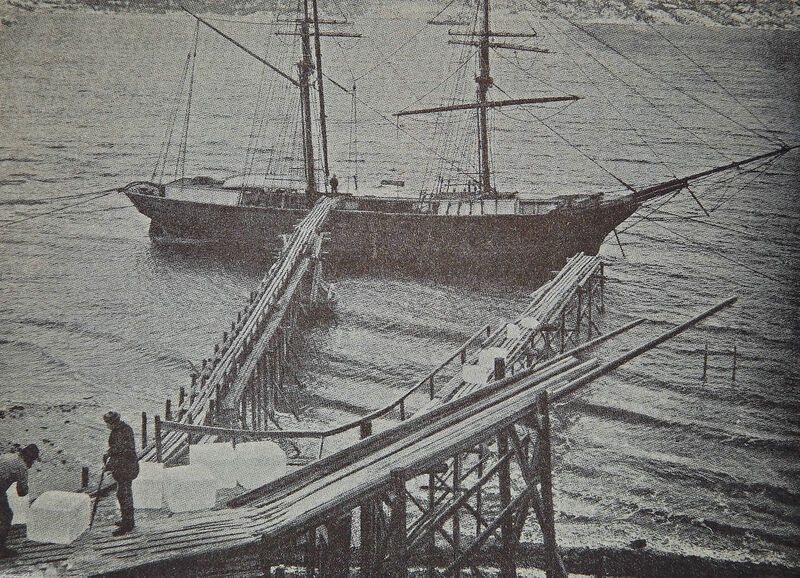 She was 4208 tons and a single screw steam driven vessel. She plied the European and Atlantic trade routes and as already said was carrying Maize when she called to Waterford in 1932. Her arrival sparked a lot of interest in Waterford apparently, because after the break up of the Austro-Hungarian empire, it was the first time the new flag had appeared in the city, and it made the local papers. Two years later, 1934, the Honved was sold to the Italian company of Martinolich & Figlio and renamed the Carlo Martinolich and was registered at the port of Trieste. 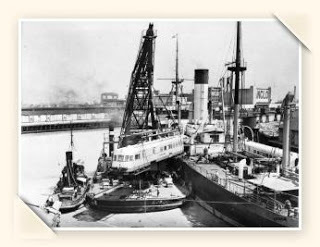 I could only find one mention of her under her new name in Irish records, and that was in August of 1936 arriving into Dublin with a cargo of wheat from Fuime and departing four days later for Avonmouth. I could find nothing about Waterford, although had she called, even under a new name, I’m confident it would have been noticed. She continued under her new name up to and including the outbreak of the war, during which she continued to sail under the Italian flag, and thus was a legitimate target for the allied side. 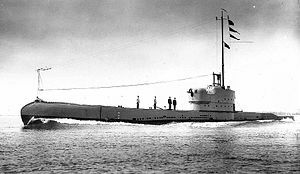 On the 9th January 1941 the Carlo Martinolich was torpedoed and sunk while sailing out of the Adriatic about 10 nautical miles east of Punta Stilo, Calabria, Italy at position 38°28’N, 16°44’E. One crew man died, four were reported as missing and thirty four were later recovered by an Italian torpedo boat. The torpedo was dispatched from HMS Parthian. So that became the fate of the SS Honved. Had she survived she doubtless would have returned, or a local would have spotted her in some foreign port and an account of her would have come back to Cheekpoint. There are few memories more enduring in a seafaring town or village than the men who plied the trade or the ships they sailed on. I for one am delighted to have finally completed the account of the SS Honved, an ordinary cargo vessel that called to port and left an extraordinary mark on the people of Cheekpoint. 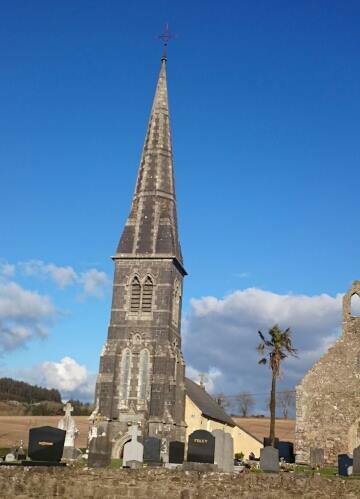 Have you ever wondered why a palm tree stands in Faithlegg graveyard. 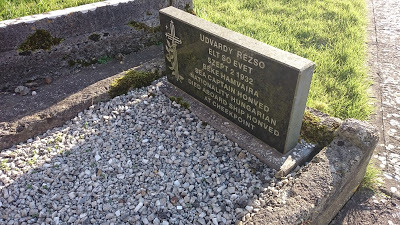 It marks the grave of Captain Rudolph Udvardy, a Hungarian Sea Captain. He fell ill while aboard his ship the SS Honved at Cheekpoint in 1932 and eventually died. 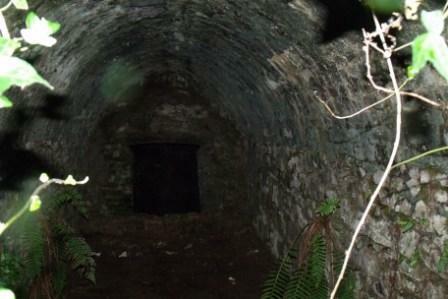 I blogged an account of it before through a story well known in Cheekpoint following the removal of his coffin to Faithlegg, called the Night the Devil came for the Captains corpse. His wife Rosa was aboard the SS Honved at the time, and she offered a bereft sight to the congregation when the Captain was laid to rest. The ship subsequently departed the harbour, and I believe his widow was aboard. She was never to return. All Saints Day will soon be here again & my thoughts, as always are with my (late) husband. I am deeply grieved to say that this year it is absolutely impossible to send money for the mass & flowers. It is strictly prohibited to send it out of the country. I will have the Mass (read) here, I beg you to see that the grave is in order, and place a few simple flowers and a candle on it. Furthermore, (following) your kindness of (heart), I ask you to (place) a flower on the grave on the following dates: Birthday 21st December, Wedding day 28th February, (?) day 17th April, Death 2nd September. I cannot be there in person, the distance is so great, and I beg you to do it for me. Dear Mr Paddy when all the (political) trouble is over and everything is normal again, I will send the money to cover all the expenses. As a mark of my respect for you in have (enclosed) a photograph of my dear husband. The little picture is the (famous) road Church of (Tersalli) which stands on the hill near here. We are having dreadful weather (?) now, heavy rainstorms, & (sudden) changes of temperature. There is every sign that winter is approaching. How are you and your dear family getting on? I expect you are also having bad weather in your country. Wishing to be kindly remembered to your wife and dear children. This was the last letter that Rosa wrote. We have put in brackets the words we are unsure of. The Mr Paddy was Paddy Heffernan of Ryans Shore, known as the Shag because, like the seabird, he was a great swimmer. His home and family were obviously a great comfort to Rosa at the time of her husband’s illness and subsequent death. Some years back, the rusted grave marker crumbled to dust. But a simple stone marker sprung up in it’s place. I only know that the headstone was a donation from an anonymous donor. As a child I recall that flowers occasionally appeared on the grave. Perhaps the following letter may explain it more. The reason this was Rosa’s last letter we can only speculate. Perhaps the address is the most instructive. 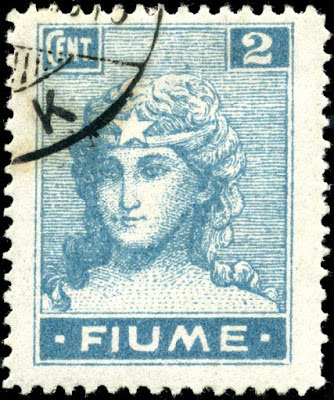 The Honved was registered in the port of Fuime which was in a disputed region called the Regency of Carnaro, the address used by Rosa in the letter. The area was historically fractious and had seen an ebb and flow of rulers and governments down the years. The difficulties raised in the letter refer to the political situation caused under the government of Mussolini and his fascist Italian state. During WWII tensions boiled over with regular attacks by partisans in retaliation for axis attacks, and following the war the area fell under the rule of Yugoslavia. The city of Fuime is now known as Rijeka. and is part of Croatia. In this context it is no surprise that Rosa’s letters dried up. One can only speculate, but it would not be hard to imagine that in the context of political unrest and subsequent war that simple everyday activities such as posting a letter might become impossible. It’s also possible, if not probably, that Rosa herself became a casualty of such strife. Surely had she survived, even as a refugee in another state, some subsequent letter would have emerged. The letter itself was painful for us to read. The love and affection for her departed husband is obvious, and the comfort she would have gained from knowing that the grave was still cared for would, I feel, have been immense. Sitting on his grave Sunday fortnight, the 28th, the anniversary of their marriage, I couldn’t help wonder about her. Reunited again, no doubt, at this stage, perhaps the upkeep is no longer so important. And yet maintained it is, and maybe, because of the Palm tree she sent, one of the most notable graves in the graveyard. Next weeks blog, a question I have been asking since childhood: What happened to the MV Honved? I have to thank the work of Jim Doherty (RIP) and his book, the Next House which he self published in the 1990’s and from which I got a very hazy copy of Rosa’s handwritten letter transcribed above. I also want to thank my wife Deena and daughter Hannah for helping me to try decipher what the letter said.